The Printronix P8220 is the fastest line printer in the new Printronix P8000 family. With a print speed of up to 2000 lpm, it's the fastest matrix line printer available. 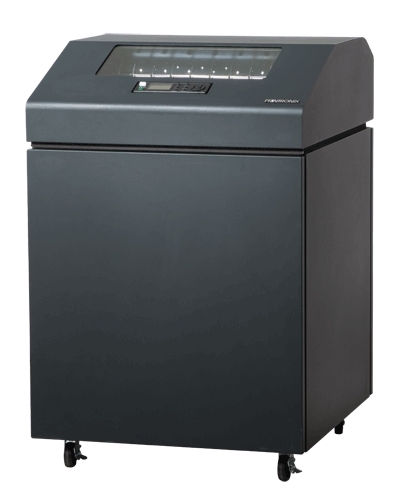 Built into a sound-suppressed (55 dBA) quiet cabinet style for high speed and quiet operations, this printer is the most popular model for those companies with serious amounts of mission-critical printing. Click here or on the image at right for specifications. This printer is able to process a box of single part paper in around 30 minutes - or much less. �When the P8220 looks ahead and senses a lot of space with no print required, it leaps to the next line to print. This ability to jump is called paper feed or "slew", and the paper goes by at up to 39 inches per second! If the customer output has few lines of print, it can empty a box of paper in a few minutes. The Printronix P8200 Quiet Cabinet models are well-suited for normal office operations�and in noise-adverse areas. � This�P8C20 provides the operator with�a�wide choice in paper handling options. Plain and simple.... the job of the P8220 printer is to produce high volumes of printed output on a very reliable basis. When your�company relies on printed output to operate, having a maintenance plan in place that matches the mission-critical nature of the printer is number 1.